Bam! Bang! Pow! Vinyl Idolz: a mash-up of pop culture with a wicked Funko bent! This stylized figure depicts Batgirl from the cult classic 1966 Batman television series. Figure measures approximately 8 inches tall. Collect them all! Bam! Bang! Pow! Vinyl Idolz: a mash-up of pop culture with a wicked Funko bent! Vinyl figure stands approximately 8 inches tall. 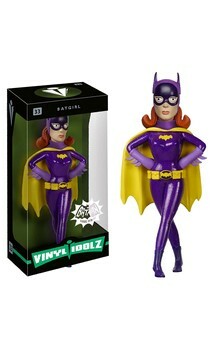 It's Batgirl from the cult classic 1966 Batman television series!